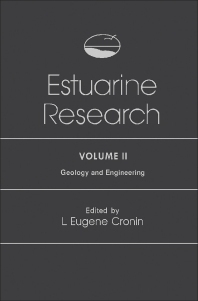 Estuarine Research, Volume II: Geology and Engineering contains the papers presented at the 1973 Second International Estuarine Research Conference, held by the Federation at Myrtle Beach, South Carolina. This volume is organized into two parts encompassing 35 chapters. It provides publications on geology, with collections on Estuaries with Small Tidal Ranges, Intermediate Tidal Ranges, and Large Tidal Ranges, and an additional section on Wide-Mouthed Estuaries. This text also includes materials on Engineering, with emphasis on Use of Vegetation in Coastal Engineering and on Estuarine Dredging Problems and Effects. This book will prove useful to estuarine biologists and ocean scientists.